CBSNews.com will stream CBS News’ historic broadcast coverage of President John F. Kennedy’s assassination to mark the 50th anniversary of the shooting. The extensive online offering will feature the minute-by-minute CBS News broadcasts in real time as they were delivered during the four-day period following the assassination. 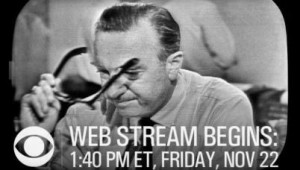 CBSNews.com’s special four-day anniversary online stream will begin at 1:40 PM ET on Friday, Nov. 22, 2013 with the first breaking network television news bulletin alerting viewers shots had been fired in Dallas. CBSNews.com will then stream the CBS News coverage, including the first report from legendary anchor Walter Cronkite and the extraordinary broadcasts from New York, Dallas, Washington and around the world as it unfolded over four days, culminating with the president’s funeral. The historic coverage will continue through the weekend, ending Monday, Nov. 25 with coverage of the president’s funeral and other news of that days. “Face The Nation” anchor and CBS News chief Washington correspondent Bob Schieffer, who was a reporter at the Fort Worth Star-Telegram on the day of the assassination, will introduce the online stream. Schieffer will also recount his extraordinary experience as a young journalist who conducted the first interview with Lee Harvey Oswald’s mother, while giving her a ride from Fort Worth to Dallas to see her son in custody hours after he fired the fatal shot. In addition to the as-it-happened web streams, CBSNews.com will provide ongoing coverage of the 50th anniversary commemoration events and in-depth reports on Kennedy’s presidency, including features on the space race, civil rights, and foreign policy. Also, a schedule on the site will let viewers know when to tune in to the stream for specific reports and highlights, and CBS News will live-tweet the streaming coverage from Friday, Nov. 22 through Monday, Nov. 25. Likewise, key moments from the streamed CBS News footage will be available on-demand at CBSNews.com and will be shared on the CBS News accounts on Twitter, Facebook, and Instagram with the hashtag #JFK50. CBS News will share exclusive clips and previews of its broadcast coverage on Instagram as well.